The message was clear. Nintendo is not content to rest on its Wii motion controls to sell consoles; it is stepping up to bat with an aggressive lineup of games coming out in the next six months. 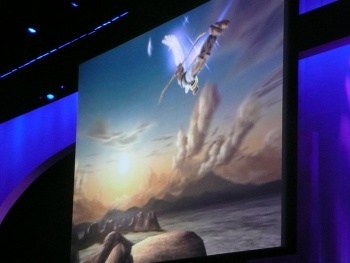 The presentation led off with Shigeru Miyamoto bursting onto the stage to demo the latest Zelda, now titled Skyward Sword. You know that the rest of the lineup was top notch when the Zelda was arguably the least impressive of the bunch. Here are just a sampling of the titles shown that are coming out this year: a new GoldenEye 007, Kirby Epic Yarn, Donkey Kong Country Returns, Just Dance 2, Epic Mickey and for the new 3DS, Kid Icarus Uprising. Some of the other titles in the mix for 2011 are Wii Party (a collection of games starring your Mii) and Mario Sports Mix (Mario playing volleyball, dodgeball, and other sports) and Skyward Sword. Miyamoto's demonstration of using the Wii remote and the Nunchuk as sword and shield respectively was interesting. Unfortunately, and this was repeatedly blamed on "wireless interference," Miaymoto wasn't that great at playing his own game. But it was somehow endearing watching him struggle to swing the sword the correct way, just as a novice might when he picks up the game for the first time. The item interface is supposed to be more streamlined, and there are a few new fun toys including a whip and a flying beetle contraption. Nintendo is letting us play Skyward Sword in the Nokia Theater. Check out my hands-on for more info. The bad news is that Skyward Sword still needs development time. It's pushed back to "next year." The biggest push was for the new Nintendo 3DS. Fils-Aime, President of Nintendo America, made a big deal about not having to use glasses, which will be expensive for consumers and look stupid in the process. Satoru Iwata, Nintendo CEO, took the stage and handled the 3DS to show off its design. The touch screen is at the bottom, with the 3D screen at the top being purely for looks (fingerprints would ruin the 3D fidelity). There are new controls, including a slide pad and a 3D slider which will allow you to manually control the 3D effect. The best innovation though is 2 camera lenses on the back of the device which will allow you to take and share 3D pictures on your own. Iwata then said that the 3DS would be the first Nintendo console which will have substantial third party support. Some of the companies and titles he mentioned who were developing 3DS games included Activision (DJ Hero 2), Square-Enix (Kingdom Hearts 3D), Capcom (Resident Evil), Konami (Metal Gear Solid) and Ubisoft (Assassin's Creed). Iwata then showed a video of third party developers first impressions of the device, all of them praising its capabitilies. Perhaps the greatest reveal was that Nintendo's partnership with Project Sora announced in January 2009 was formed exclusively to create games for the 3DS. The first title will be familiar to many gamers who've been playing for a long time: Kid Icarus Uprising. I can't think of a better title to show off 3D gaming then one where you inhabit the winged Kid and fly through the sky. The trailer was awesome, with the Kid remarking, "Sorry to keep you waiting!" Sorry indeed, where have you been all these years, man? While Nintendo didn't pull a Microsoft and give everyone a 3DS handheld on the spot (Damn you Susan Arendt! ), Fils-Aime did bring out a whole bunch of ladies with the consoles, allowing everyone at the press conference to test drive the 3DS for themselves. Look for more info in my forthcoming hands-on. That's it, the Nintendo Press Conference at E3 2010 was a lot less meh-inducing than I thought it would be. And there was no mention of the Vitality Sensor, which is a huge plus in my book. Nintendo aims to kill the competition with content this year, and based on the titles they showed, it might just pull it off.